Scott Branting, director of the Oriental Institute’s Center for Middle Eastern Landscapes (CAMEL) at the University of Chicago is looking for DHCS attendees who may want to participate in a hands-on, pre-colloquium GIS workshop. Please contact Scott directly if you would like to learn more about GIS (Graphic Information Systems) for the Humanities or help organize the workshop or a GIS birds-of-a-feather meeting. Jason Rhody from the NEH’s Office of Digital Humanities has offered to hold a pre-colloquium workshop for attendees on Nov. 1st on grants programs in the digital humanities. This is a great opportunity to meet a program officer and learn how best to apply for one of the many grants administered by the NEH. The talented crew at Studio Blue has created a beautiful poster for us to advertise the DHCS colloquium. Next week I’ll send out a few copies of this in tabloid format to various digital humanities centers. If you’d like some for your institution as well please drop us a line. Here is a link to download a larger version of this image as a PDF file. 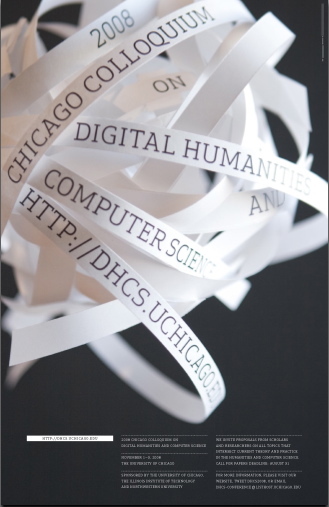 Welcome to the website of the third annual Chicago Colloquium on Digital Humanities and Computer Science (DHCS). If you’re unfamiliar with DHCS, please see our homepage for a brief overview and a description of some of the additions we’ve made to this year’s event. In the days ahead we’ll be updating this blog regularly with news and announcements related to the colloquium. Until then, please see the “Call for Papers” copied below (deadline: August 31st). Please feel free to use make use of the blog comments or email us at dhcs-conference@listhost.uchicago.edu for questions, comments etc. You can also contact us and track our updates on our Twitter page, dhcs2008. The goal of the annual Chicago Colloquium on Digital Humanities and Computer Science (DHCS) is to bring together researchers and scholars in the humanities and computer science to examine the current state of digital humanities as a field of intellectual inquiry and to identify and explore new directions and perspectives for future research. The first DHCS Colloquium in 2006 examined the challenges and opportunities posed by the “million books” digitization projects. The second DHCS Colloquium in 2007 focused on searching and querying as both tools and methodologies. The theme of the third Chicago DHCS Colloquium is “Making Sense” – an exploration of how meaning is created and apprehended at the transition from the digital to the analog. We invite submissions from scholars, researchers and students on all topics that intersect current theory and practice in the humanities and computer science. Sponsored by the Humanities Division, the Computation Institute, NSIT Academic Technologies and the University Library at the University of Chicago, Northwestern University and the College of Science and Letters at the Illinois Institute of Technology. Oren Etzioni is director of the Turing Center and professor of computer science at the University of Washington where his current research interests include fundamental problems in the study of artificial intelligence, web search, machine reading, and machine learning. Etzioni was the founder of Farecast, a company that utilizes data mining techniques to anticipate airfare fluctuations, and the KnowItAll project, which is is building domain-independent systems to extract information from the Web in an autonomous, scalable manner. Etzioni has published extensively in his field and served as an associate editor of the ACM Transactions on the Web and on the editorial board of the Journal of Data Mining and Knowledge Discovery, amongst others. Stephen Downie is associate professor in the Graduate School of Library and Information Science at the University of Illinois at Urbana-Champaign. His research interests include the design and evaluation of IR systems, including multimedia music information retrieval, the political economy of inter-networked communication systems, database design and web-based technologies. Downie is the principal investigator of the International Music Information Retrieval Systems Evaluation Laboratory (IMIRSEL) which is working on producing a large, secure corpus of audio and symbolic music data accessible to the music information retrieval (MIR) community. DHCS will begin with a half-day, pre-conference on Saturday, November 1 offering introductory tutorials and/or seminars on topics such as text analysis/data-mining or GIS (Geographic Information Systems) applications for the humanities. We also encourage colloquium attendees to use the pre-conference period for informal “birds of a feather” meetings on topics of common interest (e.g. “digital archaeology”). The formal DHCS colloquium program runs from Sunday, November 2 to Monday, November 3 and will consist of four, 1-1/2 hour paper panels and two, two-hour poster sessions as well as three keynotes. Generous time has been set aside for questions and follow-up discussions after each panel and in the schedule breaks. There are no parallel sessions. For further details, please see the preliminary colloquium schedule. Please submit a (2 page maximum) abstract in Adobe PDF (preferred) or MS Word format to dhcs-submissions@listhost.uchicago.edu. A limited number of bursaries are available to assist graduate students who are presenting at the colloquium with their travel and accommodation expenses. No separate application form is required. Current graduate students whose proposals have been accepted will be contacted by the organizers with more details. Please email dhcs-conference@listhost.uchicago.edu or tweet dhcs2008. * Arno Bosse, Senior Director for Technology, Humanities Division, University of Chicago. * Catherine Mardikes, Bibliographer for Classics, the Ancient Near East, and General Humanities, University of Chicago Library.